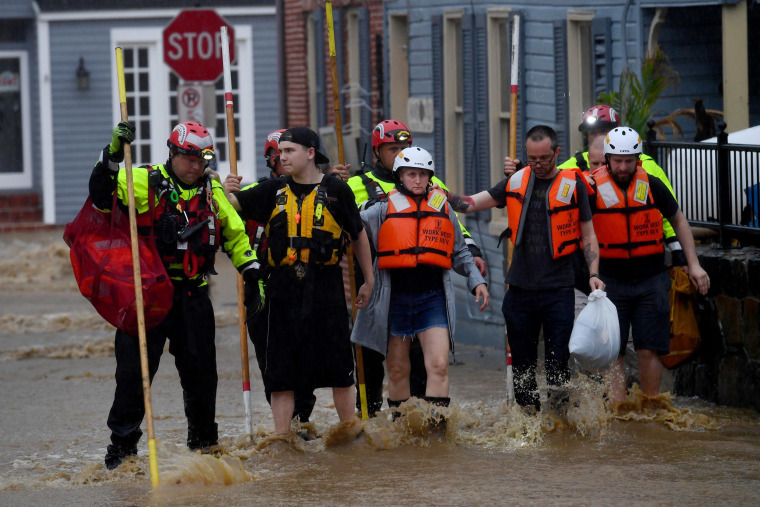 In just two hours, more than 6 inches of rain fell, and the Patapsco River rose 17 feet, submerging the green valley in muddy waters. 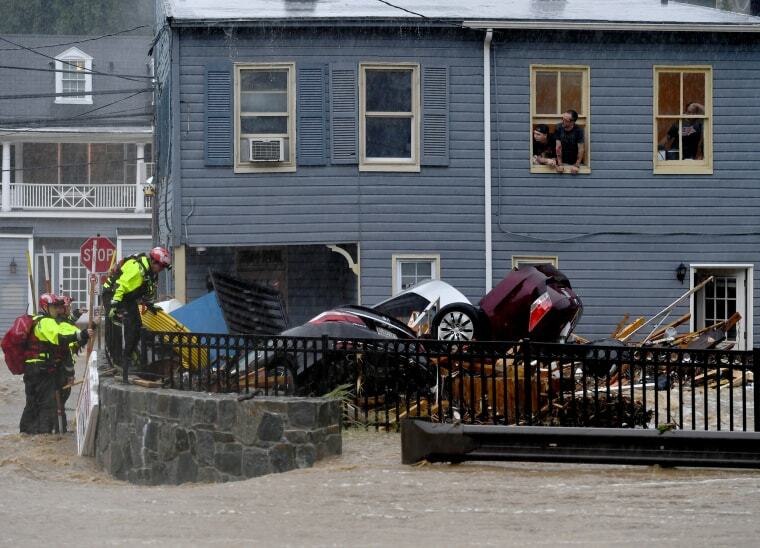 Workers clear a car from the creek behind a business facing Main Street on Monday, a day after a devastating flood ripped through Ellicott City, Maryland. 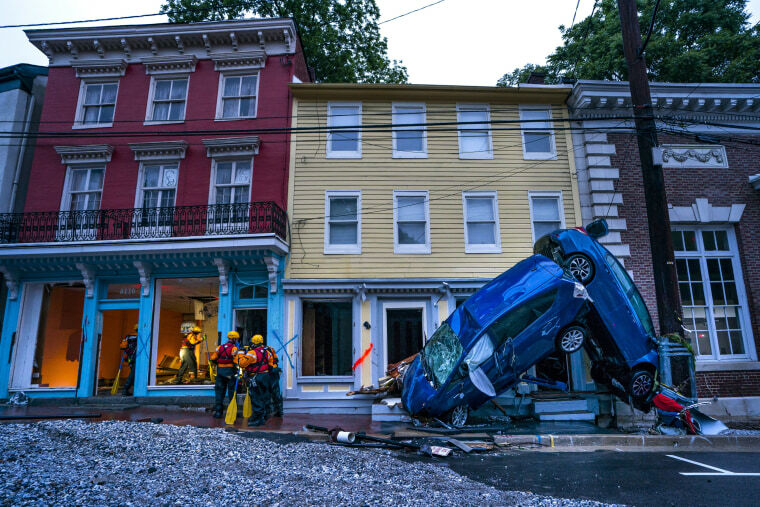 The power of the flash floods ripped small buildings from their foundations, lifted cars and scattered them like toys, and forced more than two dozen rescues in the historic mill town of 65,000 people. 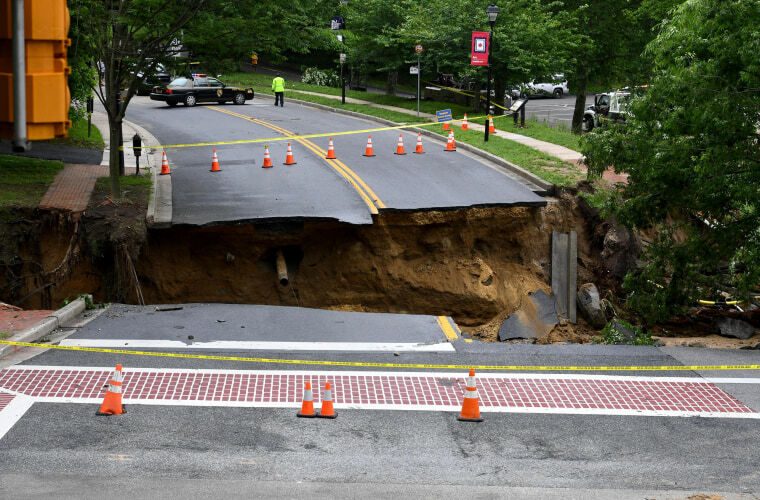 Ellicott Mills Drive on Monday after parts of the road were washed away. 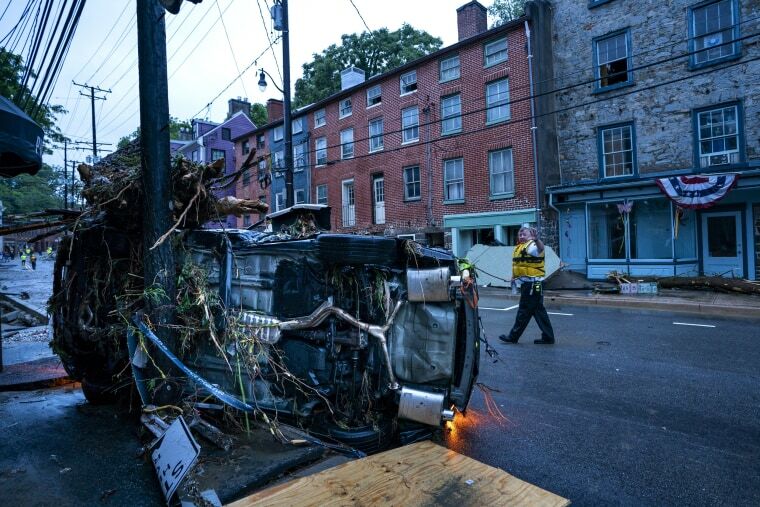 The torrent of floodwaters that raged through downtown Ellicott City on Sunday took many residents by surprise. 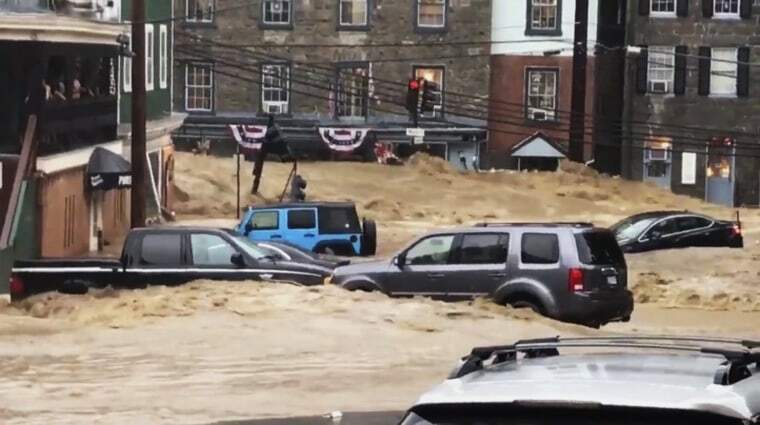 Although the roiling waters had receded by early Monday, the scenes of devastation looked worse than they did two years ago, residents said, when what was called a "once-every-thousand-years flood" killed two people and nearly wiped out Main Street. 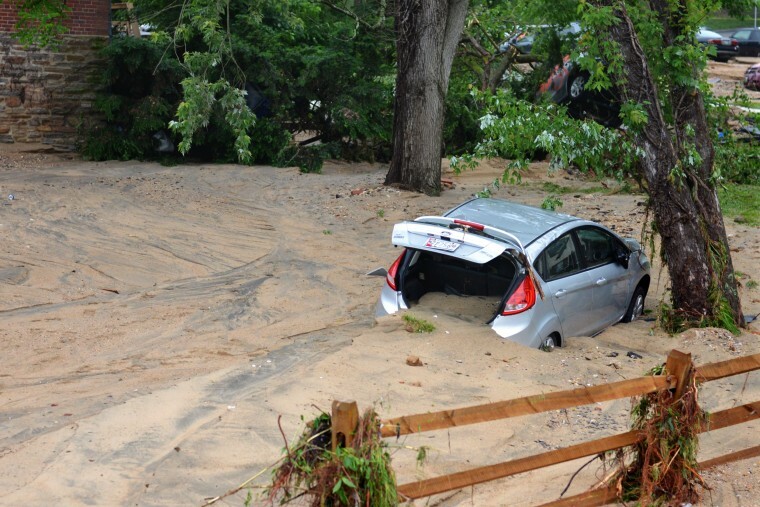 A car was swept into the riverbank just off Main Street. 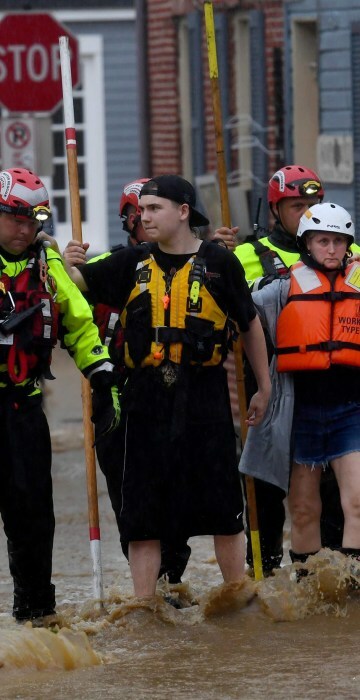 Kelli Myers, who owns two businesses that were flooded, and her son Sam were rescued on Sunday. Water rushes through Main Street on Sunday. 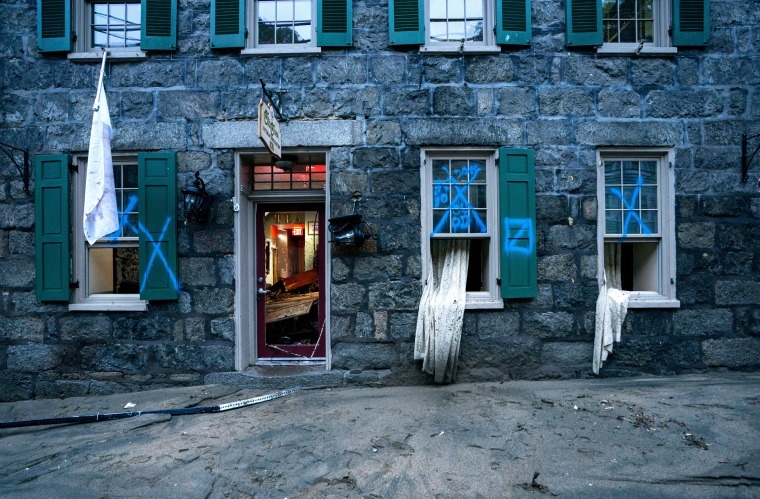 Many residents of Ellicott City had just finished rebuilding from a major flood two years ago. 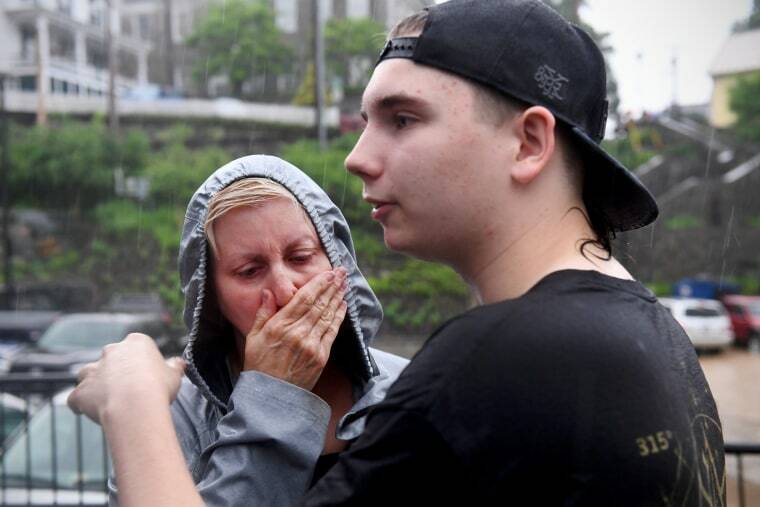 Sam Myers, second from left, and his mother, Kelli, were rescued Sunday from a record store where they had taken refuge. 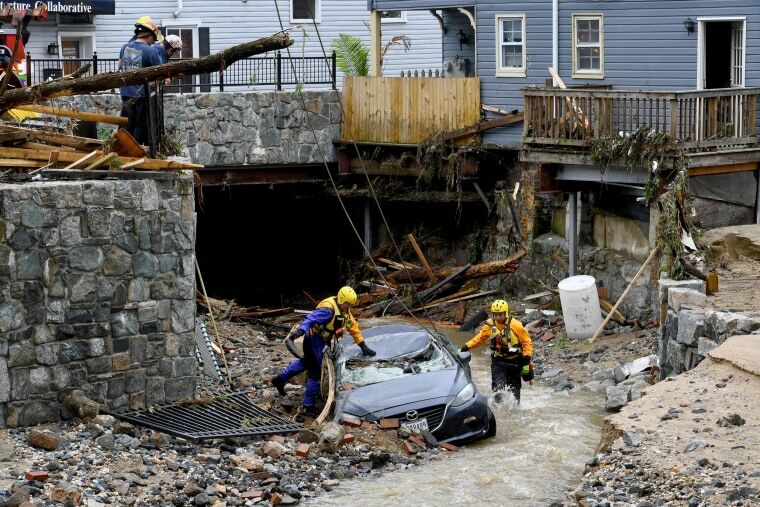 Rescue workers check cars for victims on Sunday. 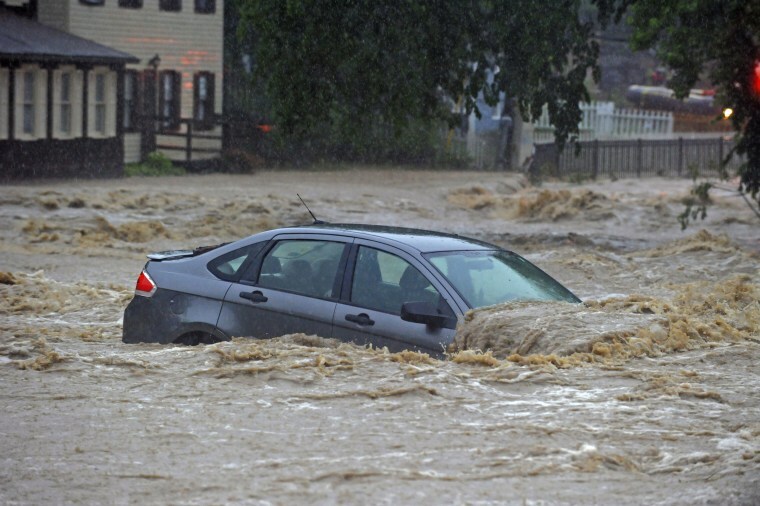 A car is flooded in a lot on Sunday. A damaged building on Main Street on Sunday. 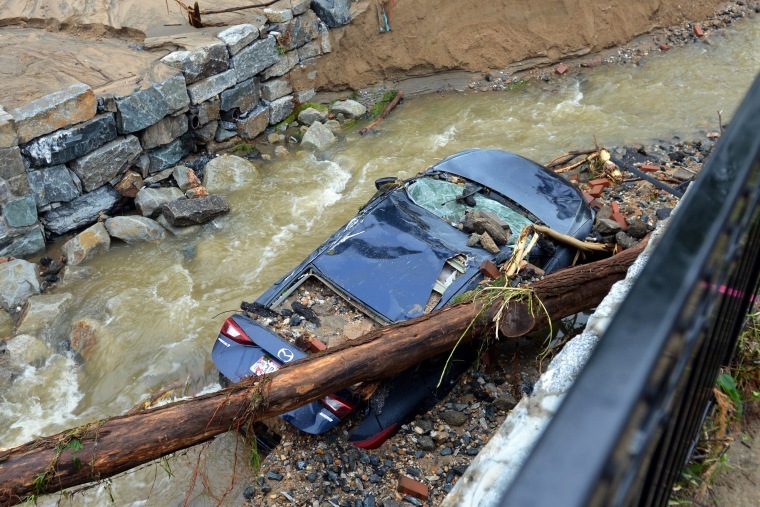 Water swirls past a car that was swept into the riverbank and smashed by a fallen tree just off Main Street. 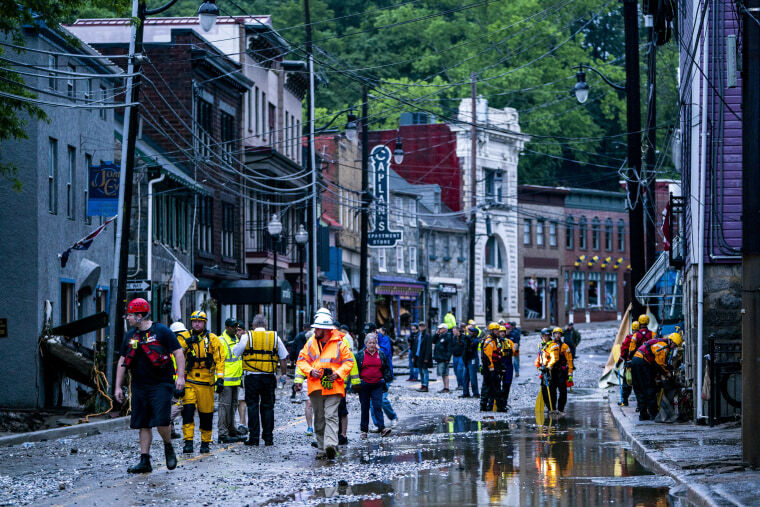 Rescue workers examine damage on Main Street on Sunday. A car on its side on Main Street on Sunday. 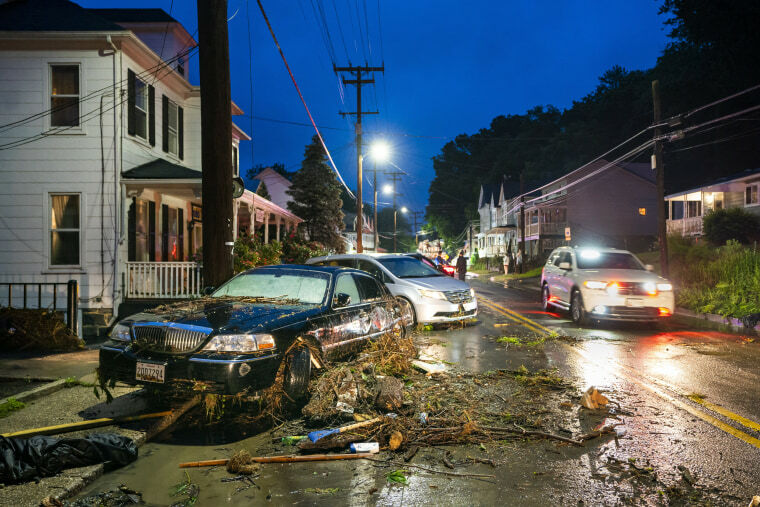 Much of the devastation from two years ago had already been repaired when Sunday's storm struck, Howard County Executive Alan Kittleman said, and more than 90 percent of the businesses on Main Street had reopened.